Many aspects of laser dynamics can be well investigated with numerical simulations, e.g. with the software RP Fiber Power. The dynamic behavior of a laser is determined by the interaction of the intracavity light field with the gain medium. 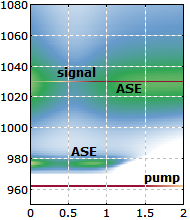 Essentially, the intracavity laser power can grow or decay exponentially according to the difference between gain and resonator losses, whereas the rate of change in the gain is determined by stimulated and spontaneous emission (and possibly by other effects such as quenching and energy transfer). where TR is the cavity round-trip time, l the cavity loss, gss the small-signal gain (for a given pump intensity), τg the gain relaxation time (often close to the upper-state lifetime), and Esat the saturation energy of the gain medium. Dynamic aspects of special interest in the case of a continuous-wave laser are the switch-on behavior (often including spiking of the output power) and its reaction to disturbances during operation (usually leading to relaxation oscillations). In these respects, different types of lasers exhibit a very different behavior. For example, doped-insulator lasers exhibit a strong tendency for spiking and relaxation oscillations, whereas for laser diodes this is not the case. 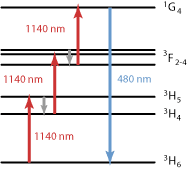 Dynamic aspects are particularly important in Q-switched lasers, where the energy stored in the gain medium undergoes a large change during pulse emission. Q-switched fiber lasers, typically having a high laser gain, can exhibit additional dynamical phenomena. This can lead to a temporal sub-structure of the pulses, which cannot be explained with equations such as those given above. Similar equations can be used for passively mode-locked lasers ; an additional term appears in the first equation, which describes the losses of the saturable absorber. The effect of this is typically that the damping of the relaxation oscillations is reduced. The relaxation oscillations may even become undamped, so that the steady-state solution becomes unstable, and the laser exhibits Q-switched mode locking or other kinds of Q-switching instabilities. How does absorption of the idler wave in the crystal of an OPO or OPA affect the efficiency of the device?